Niue is a Pacific Island paradise, one of the smallest countries on earth and the largest raised coral atoll in the world. Enjoy world class diving, fishing, walking, caving and whale interactions set in a relaxing tropical environment. 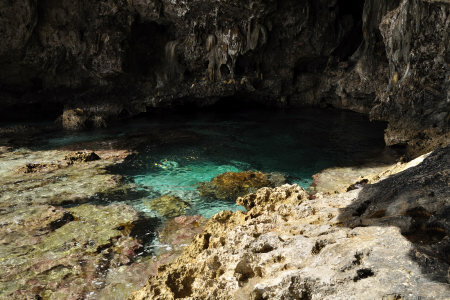 Niue is a soft adventure and ecotourism paradise. Swim with whales and dolphins, dive within underwater caverns in crystal clear water, discover your own secluded sandy cove teeming with colored fish, snorkel over bright coral in warm waters and explore breathtaking caves with ease...and that's just your first day in Niue! After you visit Niue, it will be a place about which you will say, 'I have a friend that lives there'. In fact you will probably have a few. You will arrive as a visitor and leave as a friend. Niue is also one of the world's safest destinations and one of the few countries in the world where crime is almost unheard of. It's also free of any harmful animals or insects! Discovering Niue will have you planning your return before you've even departed...so if you want a little bit of adventure back in your life, then Niue will under promise and over deliver, every time. Air New Zealand services Niue with weekly flights from Auckland, New Zealand. It departs 9:50 AM (0950 hrs) every Saturday morning ex Auckland, crossing the date line to land in Niue at 1.30 PM (1330 hrs) Friday. The return flight departs Niue at 2.30 PM (1430 hrs) Friday and arrives back in Auckland at 6.25 PM (1825 hrs) on Saturday, having crossed the dateline again. Once on the island, the 64 km road circling Niue is mostly sealed, as are most inland routes between the main town and the surrounding villages. Local sea and bush tracks connect everything else most of these are not sealed. At 269 sq. kms, Niue is over four times the size of Rarotonga. In fact, Niue's much larger than the entire Cooks group of fifteen islands put together….so we strongly recommend you hire a car, motorbike or bicycle for your stay to ensure you can access all of Niue's scenic sites and villages. There are several well established rental car companies with safe, well maintained vehicles for hire. You will also need a local driver's license from the Police Department - these are possibly the best souvenirs ever! You can also guarantee that while getting around you will make a few local friends. There are some taxis available, but their hours are variable and depending upon demand. Please check upon arrival with Niue Tourism Office for details. A number of rental car companies operate fleets of vehicles, motorbikes, vans and bikes. Bookings can be made directly to the following companies. History: Niue's history falls into four defined periods: pre-Christianity, Christianity, the Colonial era and self government. The documentation of Niue's history was primarily oral and passed down through the generations. It has only been since the period of New Zealand governance that a great deal of literature has been compiled on Niue’s history. 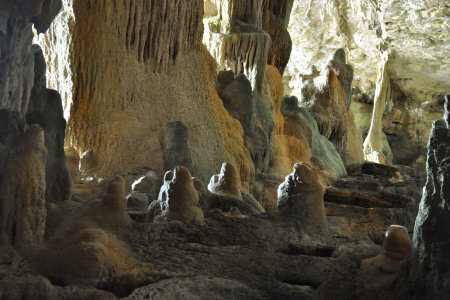 Niue is believed to have been inhabited for over a thousand years. Oral tradition and legends speak of the first settlement by Huanaki and Fao, together with the Fire Gods from Fonuagalo, the Hidden Land. Some authorities believe that the island was settled during two principal migrations, one from Samoa and one from Tonga with a smaller migration from Pukapuka in the Cook Islands. In 1774, the English navigator Captain James Cook sighted Niue but was refused landing by the locals on three different attempts. He then named Niue 'Savage Island'. Missionaries from the LMS (London Missionary Society) established Christianity in 1846. Niue chiefs gained British Protectorate status in 1900, and in 1901 Niue was annexed to New Zealand. In 1974 Niue gained self-government in free association with New Zealand and government to this day has followed a Westminster-style rule with a 20 member assembly. The Premier is selected by the House and the Premier then selects 3 other members for Cabinet posts. 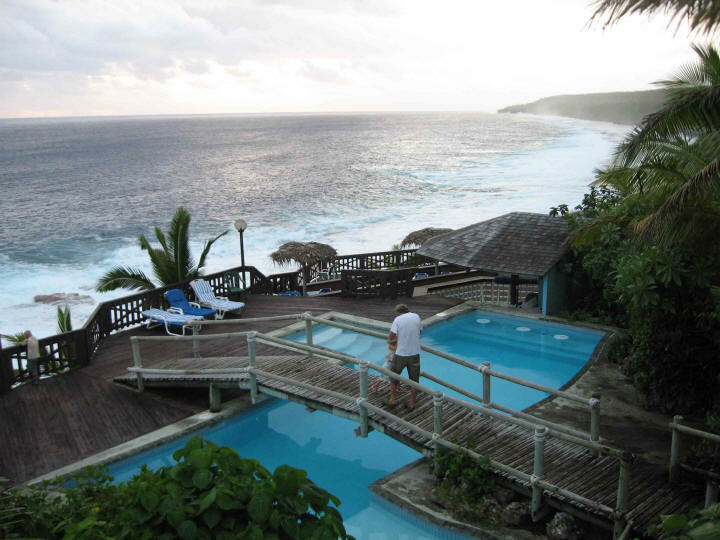 Thanks to Niue Tourism for providing most of the content on this page. Weather: Niue is a tropical island, warm during the day with a pleasant drop in temperature at night all year round. Like all South Pacific tropical islands, summer is from May – October and Winter from November to April. All year round, the temperature stays between 20 and 30 degrees C.
Customs/VISA: If possible, try to co-ordinate your visit with one of the many annual village festivals, each a memorable experience of dance, food, sport, traditional arts & fun. The church plays a large part in the community and there are many denominations catered for. Attending a mass is recommended no matter what your beliefs may be just to experience the beautiful singing. Niuean culture and craft are key components of our “Taoga Niue”and mean everything to a Niuean. Wearing swimwear in villages and the town is not advised. A paleu (sarong) should be worn around swimwear in public so as not to offend locals. 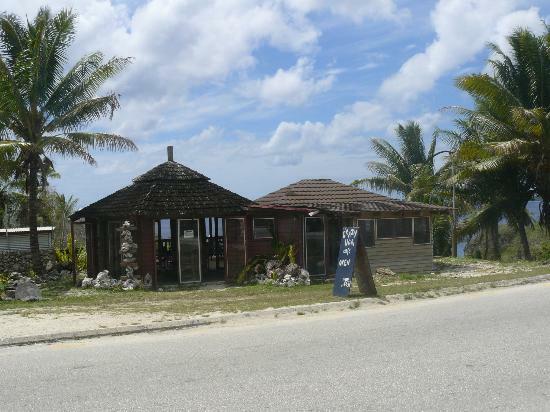 Sunday is a respected and quiet day in Niue. Most people attend church in the morning and again in the afternoon. Throughout the country, Sunday is considered to be a day of rest and worship and visitors are asked to be considerate of the local Sunday observances. Many people play golf, go sightseeing and swimming on Sunday, but certain activities such as boating and fishing are not allowed. Anyone not sure of Sunday protocols are welcome to check at the Visitor's Information Centre for guidance. Niueans openly embrace the presence of 'strangers' even during these most traditional events. Both are of immense importance to Niueans, as they mark a child's 'coming of age' – spiritually if not literally, since it can happen at any point of a child's life. These ceremonies are private in meaning but open to all, and Niueans generally welcome tourists even as on-lookers if they wish to observe. The traditional ceremony for a teenage boy is his 'Haircutting' ceremony, when the long tail of hair that he has kept since childhood is removed. Guests invited to the concurrent feast each contribute money to a fund that goes to the boy after the celebration costs are paid. For girls there is a similar 'Ear Piercing' ceremony. These gatherings are usually held on a Saturday in private homes.